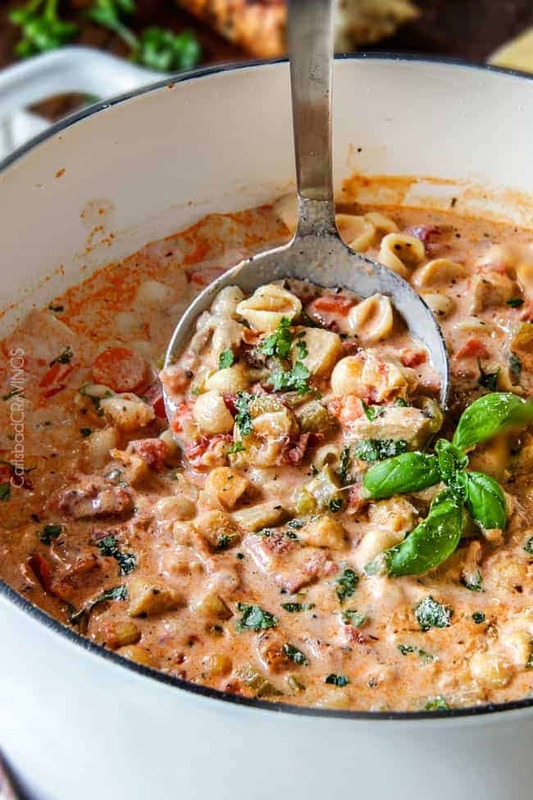 This Italian Soup is about to become your favorite anything to eat in a bowl! This Italian Soup tastes better than any restaurant at a fraction of the cost! 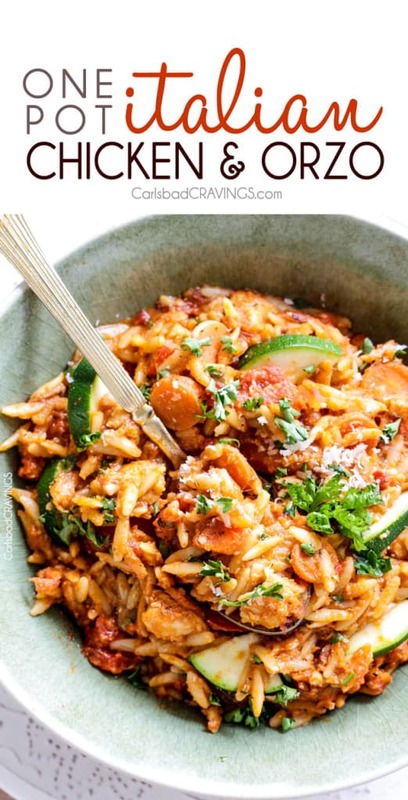 It is super easy, seasoned to perfection and bursting with tender chicken, tomatoes, carrots, celery and pasta shells enveloped by creamy Parmesan basil broth. This Italian Soup is one of my favorite soups ever. It was inspired by the ingredients and flavor profile of my Tomato Basil Soup which is pureed and mega creamy and to-live-for (another must try). 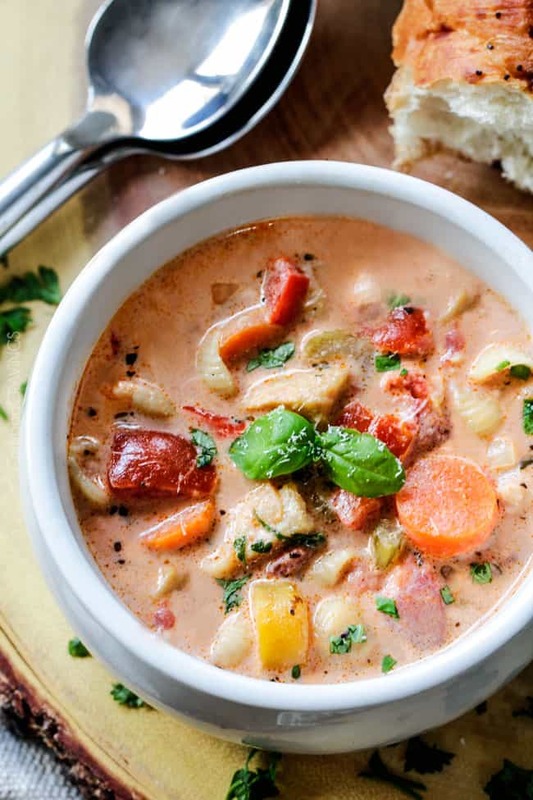 In this Italian Soup version, we get all the same wonderful flavors and creaminess but I’ve left the vegetables whole for a fabulous hearty texture. This beloved Italian Soup is swimming with tender chicken, sauteed onions, carrots, celery, bell peppers and small macaroni seasoned with bay leaves, garlic, parsley, oregano, cumin and of course plenty of fresh basil. 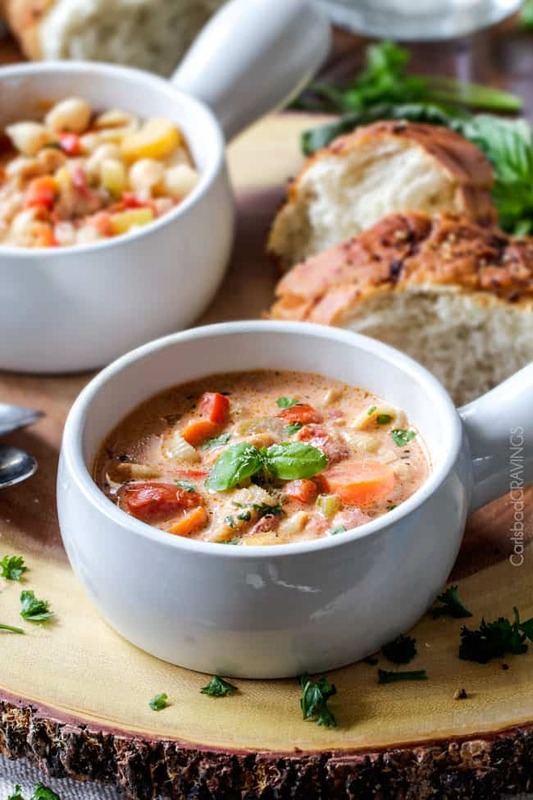 The Italian soup is delish left alone in this seasoned broth, but for over-the-top deliciousness – as in better than any restaurant – stir in Parmesan cheese and either heavy cream or half/half, and you won’t be able to stop after two bowls – you won’t even be tempted. WHAT SPICES For Italian Soup? This Italian Soup boasts a custom blend of Italian seasonings. I used a combination of dried herbs and fresh herbs for the parsley and basil. You can use dried parsley and dried basil if you prefer, but fresh is so much better and proper for Italian Soup! If you want to substitute dried herbs, the general rule is 3:1 (fresh to dried). I have also added 1/4 teaspoon red pepper flakes which enlivens the the Italian Soup. It does not make the soup spicy, but does add a kick. If you know you are sensitive to spice, then start with a pinch and add more to taste. Chicken Breasts: I always have chicken breasts on hand so this is what I used. They emerge wonderfully in this Italian Soup – just don’t overcook! Chicken Thighs: Chicken thighs are inherently juicer than chicken breasts and hard to overcook, so if they’re your thing, they will work great! . Rotisserie Chicken: You can also use shredded rotisserie chicken. You will will need about about 2 1/2 cups – but you can always add more or less to taste. Add the chicken to the Italian Soup at the end, just so it can warm through. This Italian Soup is very simple but it does require some chopping. To save time and make dinner come tougher in a flash, chop your onions, garlic, carrots, celery and bell pepper ahead of time. Store pre-cut veggies in an airtight container in the refrigerator. You can also chop your chicken ahead of time and store in a separate airtight container in the refrigerator. Cook pasta in salted water until al dente. Rinse your pasta in cold water to stop it from cooking. You can even toss it in a little olive oil to prevent it from sticking together. Take care not to overcook your pasta because it is going back in a hot soup. No one wants mushy pasta! Cook chicken in olive oil until almost cooked through. You don’t want to cook the chicken completely because it will finish cooking in the soup. You just want the outside opaque. If you completely cook the chicken now it can become dry in the soup. Remove chicken and cook onions and carrots in some olive oil and butter. We give these veggies a head start because they take longer to cook than the rest because the carrots are sliced and not chopped. Add the celery, red bell peppers and garlic and cook for 1 minute more. Sprinkle in flour and cook, while stirring, for 3 minutes. Don’t worry that the mixture will look very thick. Cooking is essential because it eliminates the raw flour taste. The flour will help thicken The Italian Soup while the cream will make it creamy. Stir in chicken stock, tomatoes, sugar, bay leaves and all remaining herbs and spices along with the chicken. Bring to a boil; cover, and reduce to a gentle simmer for 15-20 minutes. Your Italian Soup is done when the chicken is cooked through and the vegetables are tender. You don’t want to overcook the soup or the chicken won’t be as juicy. Stir in Parmesan cheese until smooth followed by heavy cream or half and half. Stir in reserved pasta. If you would like a less “chunky” soup, stir in additional broth or cream/half and half. HOW DO YOU THICKEN Italian Soup? This Italian Soup should already be rich due to the flour and the half and half or heavy cream. If you choose to use half an half, your soup will still be delicious but not quite as thick and creamy because it has less fat – and the higher the fat content, the creamer the soup. Cornstarch: Remove some broth from the Italian Soup and whisk in 1-2 tablespoons cornstarch with a fork until smooth then whisk it back into the soup. Simmer for 5 minutes or until thickened, stirring occasionally. Repeat if desired. Flour and butter: Mix equal parts flour and softened butter together with a fork so it becomes a thick paste and almost forms a ball. You will want 2-4 tablespoons each, depending on how thick you want the soup. Stir it into the soup and simmer for 5 minutes or until thickened, stirring occasionally. Repeat if desired. Can I use different vegetables? 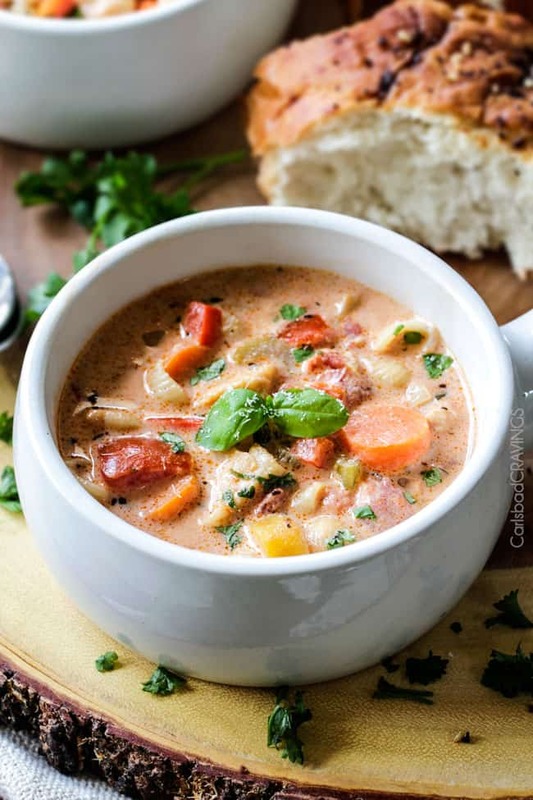 This Italian Soup is made with carrots, celery, and bell peppers, but feel free to mix it up with your favorite vegetables or whatever you have on hand. Green Beans, zucchini, spinach, corn, etc. would all be fabulous. Can I make Italian Soup with Sausage? 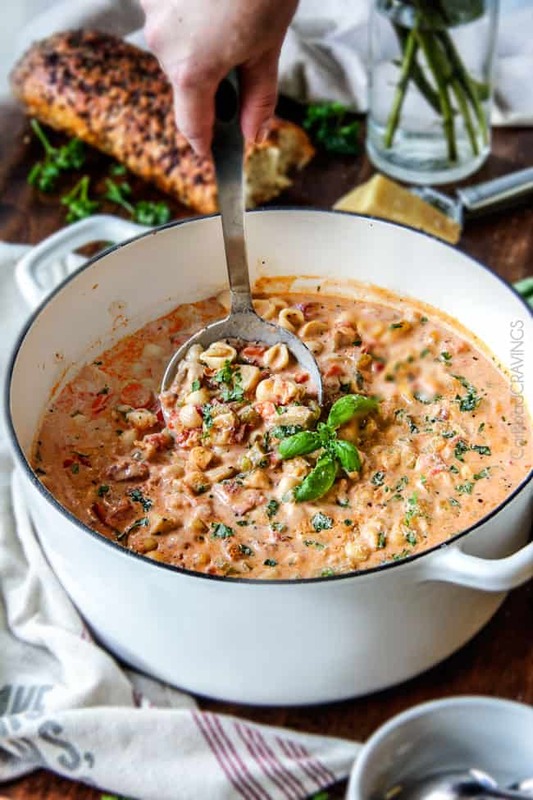 This Italian Soup is SO good, you are going to want to make it with every protein! You can swap the chicken out for ground or linked Italian sausage, lean ground beef, ground turkey, mini meatballs and even salmon! Can I half this recipe? Absolutely! You can scale this Italian Soup recipe down if you don’t have a large family and don’t want leftovers. If you do love leftovers (raising my hand high), then you will love leftover Italian Soup for an easy lunch or dinner! Can I use rice instead of pasta? Yes! You can substitute long grain white rice but I wouldn’t use brown or wild rice unless you cook it separately and then add it to the soup. Long-grain white rice will take 8-12 minutes to simmer in the Italian Soup. Can I make this Italian Soup gluten free? Yes! If you want to make gluten free Italian Soup, then use gluten-free flour and gluten – free pasta, or swap the pasta for rice. Can I make this Italian Soup vegetarian? Yes! Use vegetable broth instead of chicken and omit the chicken. You will want to add additional vegetables in place of the chicken. Consistency: The “chunkiness” of this Italian Soup is totally your choice! For a less chunky soup, simply add additional broth or half and half/cream at the end of cooking. Can I Make Italian Soup Ahead of Time? Yes! The flavors are even better the next day. Just take care you cook your pasta al-dente initially. If you aren’t serving the pasta until the next day, then keep the pasta separate then add it to the soup when reheating. What to Serve with Italian Soup? 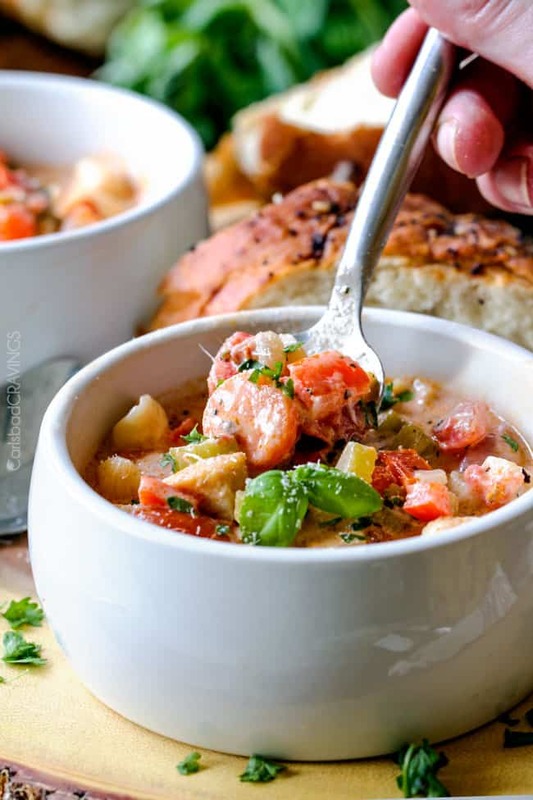 This Italian Soup is a meal-in-itself but I love serving it with big chunk of crusty bread, dinner rolls, breadsticks, or Pull Apart Cheesy Pesto Bread along with big green salad, or wedge salad and fruit salad. HOW LONG IS ITALIAN SOUP GOOD FOR? Italian Soup should be stored in an airtight container in your refrigerator. When properly stored, it is good for 3-5 days. HOW DO I REHEAT ITALIAN SOUP? Stove: You can reheat large batches of Italian Soup on the stove over medium low heat, stirring occasionally until warm. You will need to add some additional broth or half and half/cream to the soup because some of the pasta will absorb it while sitting overnight. Microwave: For smaller batches or individual servings, you can use the microwave. Transfer soup to a microwave-safe dish, cover with a microwave-safe lid or paper towel. Microwave for 2 minutes, stir, then continue to microwave for 30-second intervals, if needed. Stir in additional broth, half and half or cream to reach desired consistency. Can I freeze Italian Soup? I do not recommend freezing this Italian Soup because it has dairy in the form of half and half or heavy cream and Parmesan. When dairy is frozen, the fat separates creating a funny, unappetizing texture and it will often curdle. Pasta also does not freeze well and becomes mushy when defrosted. So, I guess you’ve got the pleasant task of consuming this Italian Soup within 5 days! Want to try this Italian Soup Recipe? 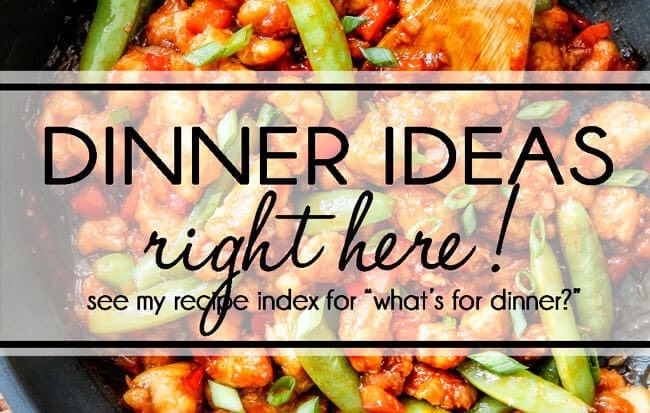 Pin it to your soup, chicken or slow cooker Board to SAVE for later! 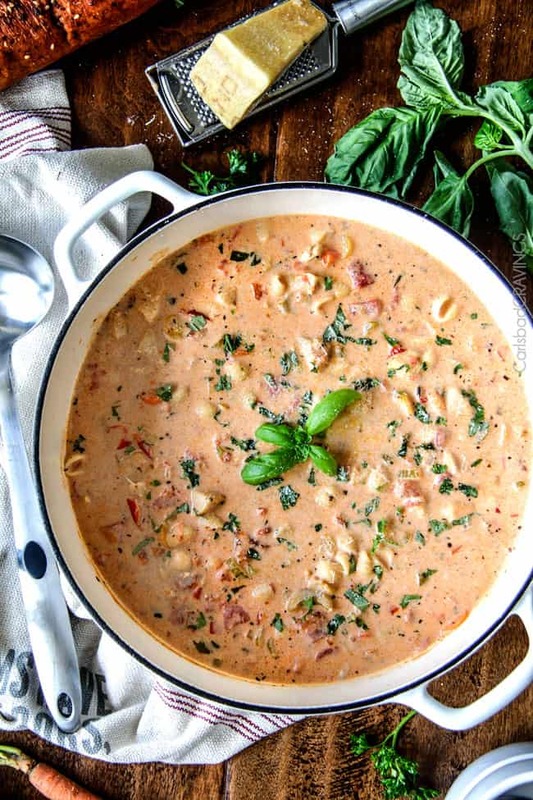 This Italian Soup tastes is about to become your favorite soup! It tastes better than any restaurant at a fraction of the cost! It is super easy, seasoned to perfection and bursting with tender chicken, tomatoes, carrots, celery and macaroni enveloped by creamy Parmesan broth. Cook pasta in salted water until al dente. Drain and set aside. Meanwhile, heat 1 tablespoon olive oil in a large Dutch oven/soup pot over medium high heat. Add chicken and cook until almost cooked through. Remove to a plate. Melt butter with 1 tablespoon olive oil in the now empty pot and heat over medium high heat. Add onions and carrots and cook, while stirring, for 4 minutes. Add 1 more tablespoon olive oil, celery, red bell peppers and garlic and cook for 1 minute. Sprinkle in flour and cook, while stirring, for 3 minutes (it will be thick). Gradually stir in chicken stock followed by chicken, tomatoes, sugar, bay leaves and all remaining herbs and spices. Bring to a boil; cover, and reduce to a gentle simmer for 15-20 minutes or until vegetables are tender and chicken is completely cooked through. Stir in Parmesan cheese until smooth followed by heavy cream/half and half. Stir in pasta. If you would like a less “chunky” soup, stir in additional broth or cream/half and half. Garnish individual servings with freshly grated Parmesan cheese and basil (optional) and season with salt and pepper to taste. *Soup will not be as creamy if you use half and half but still delicious! This soup is KILLER GOOD!!! Definitely one of my top 3 soups in my recipe box. Thank you for your wonderful blog and original recipe. You are so welcome Jeanne, I am thrilled you love it so much!!! Thank you! This is just so good. I made a batch for my lunches this week (I HAAAAATE lunch. Never know what to make, but with cooler weather soup sounds great!) Ate a cup of it in the middle of the afternoon just because- it was amazing! I will actually enjoy lunch this week! Thank you so much KT! Soups are such a great make ahead lunch idea! I am so happy this recipe will make lunch enjoyable this week :). I hope you find more soup recipes to love here! Do you think cheese tortellini would work well in this soup? absolutely! That would be delicious! I would be sure to add it the last 5 minutes as it doesn’t take long to cook. enjoy! This soup is amazing! My dad says it’s his favorite soup + one of his favorite meals! Thanks for the recipe Jen! You are so so welcome! I’m honored your Dad loves it that much! Thanks for taking the time to make my day! So I’m trying to cut out carbs… would this still taste as amazing as it looks without the pasta? I think it would still taste fabulous! I would increase some of the veggies or add another veggie you love to the mix. Hi just wondering if you’ve made this in the crockpot? Hi Kera, I haven’t but I think it would work just fine! I would add the pasta the last half hour of cooking then turn the temperature to high or even better, cook the pasta separately. Can I supplement the flour & noodles with something to make this gluten free? Hi Vicky, you can use gluten free flour or whisk in half the amount of cornstarch to the milk. You can definitely substitute the pasta with anything you like from more veggies to beans. Enjoy! Is there a non dairy alternative for the cream like coconut cream or something? Hi Bailey, I am not an expert at non-dairy but I would choose something like almond milk over coconut because you don’t want a more neutral flavor. I would mix in a tablespoon of cornstarch to almond milk or whatever you end up using to thicken in. Sorry I can’t be of more help! Loved this soup! I was wondering if it can be frozen? Hi Lorraine, I don’t suggest freezing this soup – sorry! This recipe is so delicious! I came across it several years ago and have been making it ever since. I just made a batch for a soup cook-off at work and another batch for the fridge. Thank you for sharing this deliciousness. You are so welcome Christine! I LOVE hearing it is such a favorite, thank you!